Edit: Contrast this more recent recent finding: Reducing trait anxiety by implanting false positive memories. 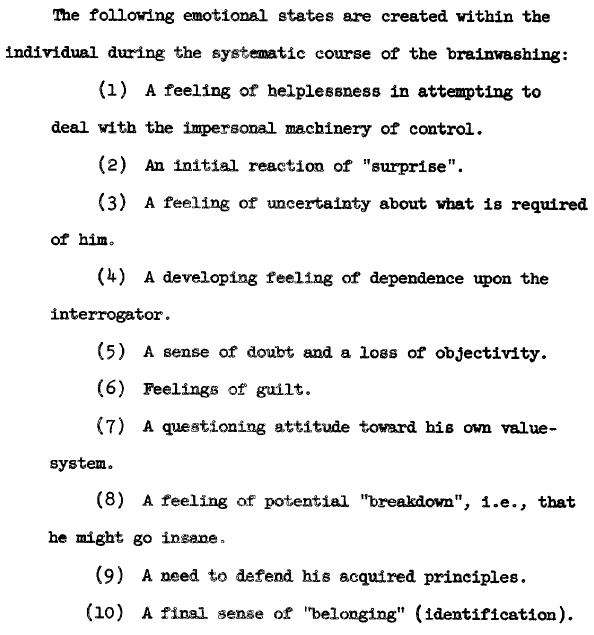 The 1956 doc above shows how harmful control of an individual (severe gaslighting) causes fear, defeat, surrender, and lastly identification with a brainwashed state. The study linked just above in this edited section produces fundamentally opposite results, though it also manipulates the mind. Both brainwashing and “implanting positive memories” work with deep personal semiological clusters of meaning and memory. One techniques debases the person and pushes them to identify with their abusers’ wishes. The other helps the person redefine painful memories and feelings to improve anxiety responses. The important thing to see here is the deep personal semiological clusters of meaning, memory, and emotion. These clusters can be identified, manipulated and changed as both of the above techniques show. How can we do this to ourselves in a beneficial way? How can we investigate our deep personal semiological clusters? How can we change them? The answer is we have to identify them as they are actively functioning in real-world, real-time situations. Then we have to analyze them. Once any particular cluster has been viewed and analyzed enough times, its strength will decrease. And as it decreases, it can be replaced by more realistic or positive features. Most people only have a few major deep personal semiological clusters that bring discomfort or harm. The way to do this is with FIML practice. FIML neither brainwashes nor implants false memories. Rather, by working with semiological clusters, FIML upgrades them. FIML is like an editing program for the “grammar” of deep personal semiological clusters. By definition, deep personal semiological clusters are important. Most of them began in the deep past and have been added to since. By observing and analyzing these clusters in real-time, partners will find they are able to upgrade them to optimize both their psychologies and their capactities to communicate with each other.